(Nanowerk News) An efficient optomechanical system utilizing ‘squeezed’ states of light has been designed by a RIKEN-led research team ("Squeezed Optomechanics with Phase-Matched Amplification and Dissipation"). The scheme makes it possible to implement quantum processes based on single light particles, or photons, using currently available optomechanical technology, with potential applications in quantum computing and the study of exotic quantum effects. A vibrating mirror interacts with light inside a mirror-confined cavity. 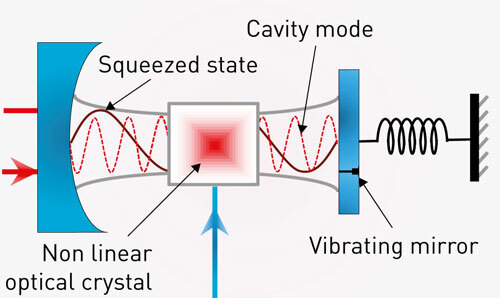 Adding a nonlinear optical crystal to the cavity creates a squeezed state of light that is coupled to the cavity modes and induces strong optomechanical coupling with the vibrating mirror with single-photon control. Interactions involving single photons display many quantum physical phenomena. One of the more interesting effects is the coupling between photons and mechanical systems. Light carries a very small quantity of momentum, which can become noticeable when light interacts with micro- and nanoscale objects. The solution proposed by Nori and his colleagues from the RIKEN Center for Emergent Matter Science and RIKEN Interdisciplinary Theoretical Science Research Group, in collaboration with the Huazhong University of Science and Technology in China, involves the use of ‘squeezed’ states of light to strengthen optomechanical coupling. Squeezed states are those in which the energy and momentum of a photon are known with the maximum accuracy possible within the limits imposed by quantum physics. The researchers have demonstrated theoretically that such states can be generated by placing a nonlinear optical crystal into the mirror cavity and applying an external amplification scheme (see image above). In this proposed system, there is a direct link between the number of photons remaining in the original light state of the cavity and the number in the squeezed state—the presence of fewer photons in the squeezed state means that more photons remain in the cavity mode state to interact with the mirror vibrations. Tuning the photon numbers in the squeezed state to the single-photon limit induces a strong coupling to the mechanical vibrations and provides control over the strength of the optomechanical interaction.